I never thought I’d say this but I need a break from comfort food. After the rainy long weekend when I hibernated in my flat I couldn’t take it any longer. I spent the weekend reading, perusing cookbooks and eating way too much. There are so many great recipes in the June ‘British issue’ of Gourmet Traveller. Sometimes though, you have to be sensible. You can’t cook a family size pork pie for one and be eating it all week (as much as I kinda wanted to). There were the Eccles cakes, my favourite and a much loved St John treat, scotch eggs and apple pies. The article on Brett Graham though really caught my interest. An Australian who has made his home and his name in London at The Ledbury and The Harwood Arms. I was surprised they included the recipes for Harwood favourites, those scotch eggs and that soda bread! I’ve tasted (in large quantities) the bread and tried to attain the recipe, now I have it! Although I haven’t had the scotch egg. I copped a bit of flack for that and I hope to rectify that, now the famous recipe has been revealed. In the mean time this mackerel is just what I need to bring me out of a winter stodge slump. It has been slightly adapted from the Gourmet Traveller. 1/2 cup loosly packed mixed parsley leaves and dill fronds. Combine all the pickling ingredients, except the cucumbers, in a food processor and blend well. Pour liquid over a sieve and into a plastic bowl. Discard the bright parsley and nori left (shame). Add the cucumbers to the pickling liquid and leave to steep in the liquid for a few hours (2-3). 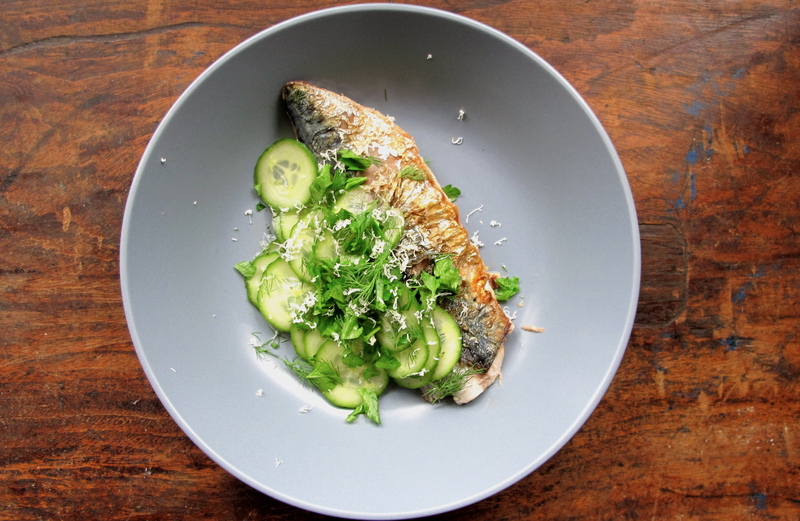 Fillet your mackerel (or have the fishmonger do it, but it’s not as fun). Lightly season with salt and olive oil, place skin side down in a hot pan. Hold the mackerel down lightly for a 30 seconds to make sure all the skin is in contact with the pan. Leave the fillets in the pan (don’t be tempted to turn them) for about 3 minutes. Then flip over and cook on the other side for a minute. Drain cucumbers from the pickling juice. 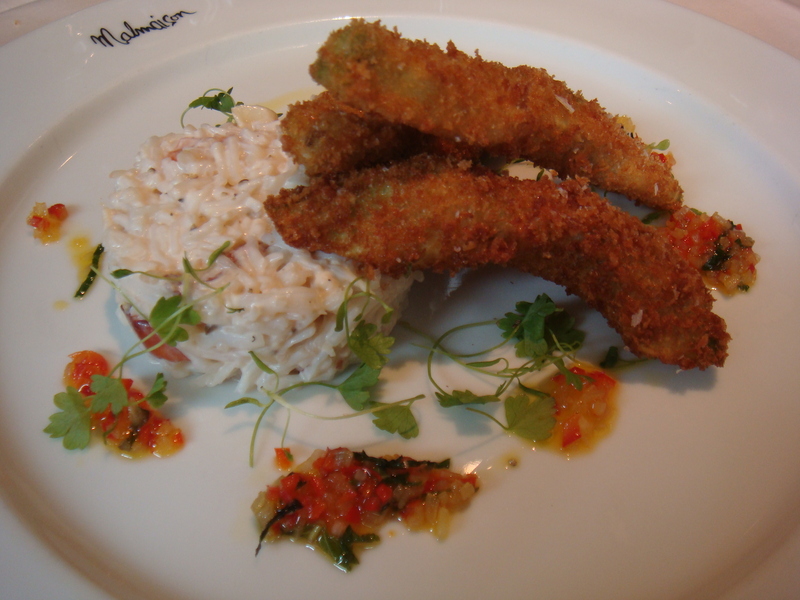 Arrange on plate, place mackerel on, crispy skin side up, add herb leaves and finely grate horseradish over. Be warmly generous with the horseradish. Any excuse to have lunch at St John Bread and Wine and I was there. I was living on the other side of London so I would somehow incorporate it into a shopping trip to Shoreditch on my day off or on the way to see a friend, anything. As I sat there, usually dining alone, I would pour over the menu wondering if I should order a few starters, and how many I could fit in by myself, or a main and dessert, decisions, decisions. 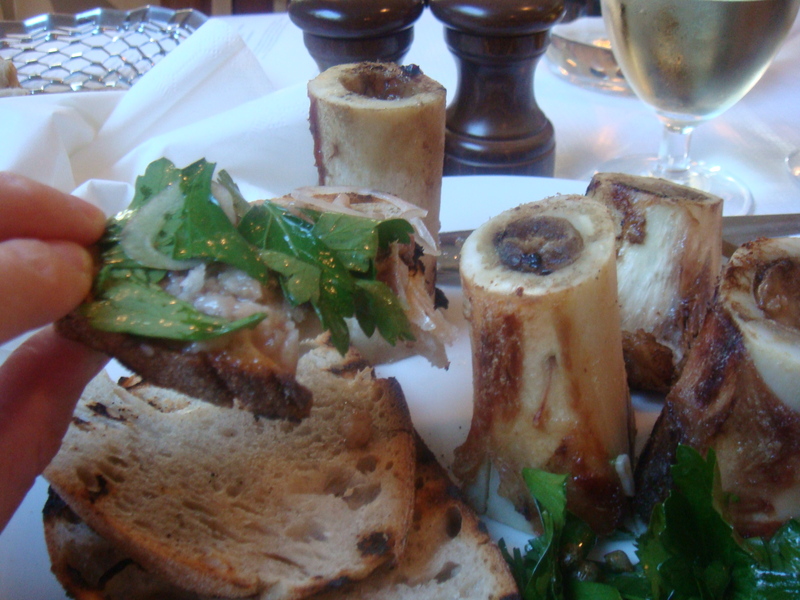 After reading Anthony Bourdain’s book, Kitchen Confidential, some years ago, I remember he was asked if he had to choose his last meal ever it would be St John Restaurant’s bone marrow and parsley salad. When Anthony Bourdain speaks I tend to take note. So where was this great bone marrow salad that they supposedly serve here at St John? I’ve never seen it on the menu? After speaking to one of the chefs it all became clear. 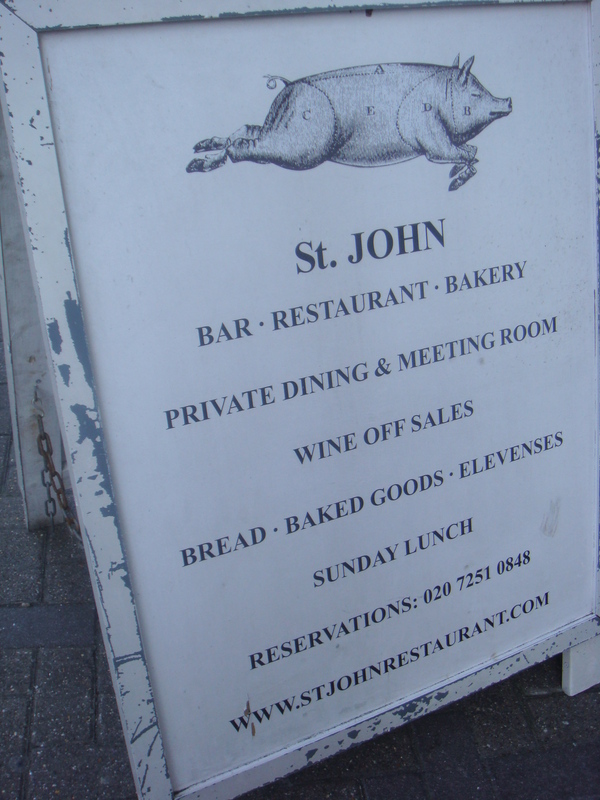 I had to go to St John Smithfield (HQ) if I wanted the dishes St John was famous for, the dishes people travel great distances to consume. St John Bread and Wine is the baby sister, and as such have a wider scope in which they can create dishes whilst still in keeping within the ethos of St John. When I think of St John I think of food cooked simply to bring great British produce to the table with a minimum of fuss, and the bone marrow and parsley salad. I ate it thinking Anthony you are right, you are so right! The rich bone marrow fat pulled from the centre of the bone looks slightly unnerving sitting on the toasted bread so the fact that you then cover it with leaves of parsley, salty capers, thin onion and wet salt, makes it easier for the first bite to get to your mouth. After that you don’t care. I didn’t care that I sat in a rare print 1950’s dress with stockings and heels, my hands covered in bone marrow fat and my face feeling like it was as well. I could have another one but I had already ordered a main. 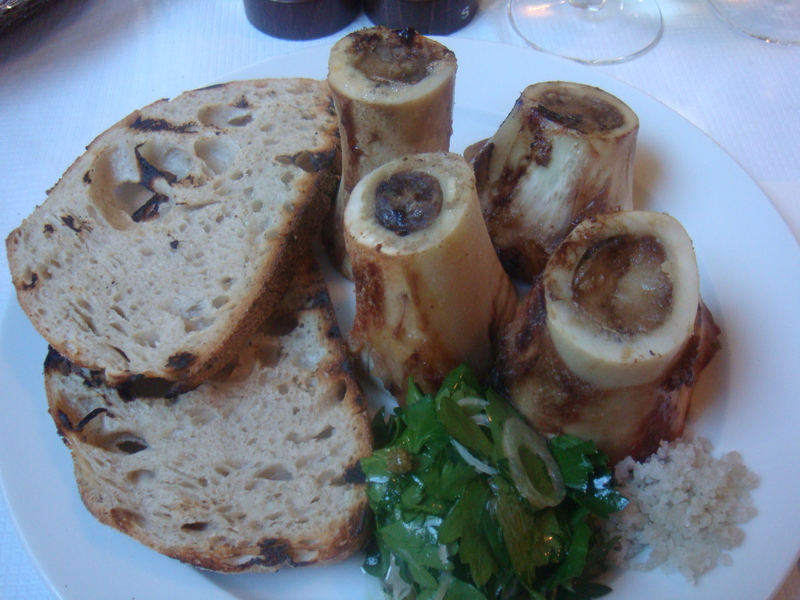 Yes I know that people have been eating bone marrow for centuries and St John didn’t totally invent the dish or anything, but they did put it on the menu along with alot of other foods and cuts of meat, people had forgotten about. Yes pigs head comes to mind along with various sea vegetables. The brill and slow roasted fennel was beautiful. Perfectly cooked fish with super crusty buttery skin, love it, although the fennel was a bit heavy in olive oil for my liking. Anyway I had just had the bone marrow, I was happy. My favourite ever dessert from St John B&W was a lemon posset with the best shortbread I have ever had. A cherry tart with sour cream ice cream came very second close. 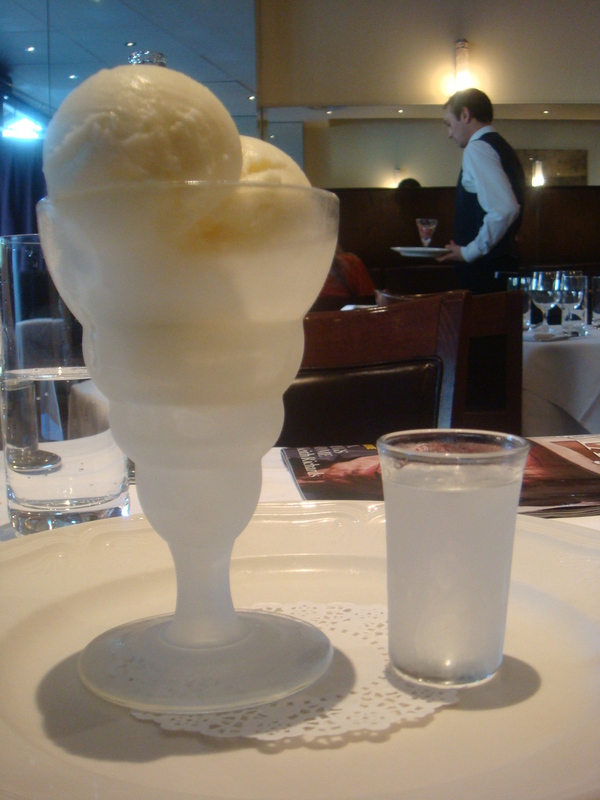 Today all I could fit in was a lemon sorbet with the obligatory vodka shot. At both sites St John have their bakery section open for select public purchases. I can never leave without bagging a loaf of their heavy tasty bread and a eccles cake, today I thought I may as well pop in some freshly baked madeleines along side my haul. They bake them to order so there is often an amazing smell wafting out of the bakery. Slowly spooning the cleansing, refreshing sorbet into my mouth, I sat there planning how it would be so easy, and not to mention cheap, to make the bone marrow salad myself. Of course I haven’t yet, probably just as well, I’m guessing my coronary arteries would not thank me for that regular dose of fat. 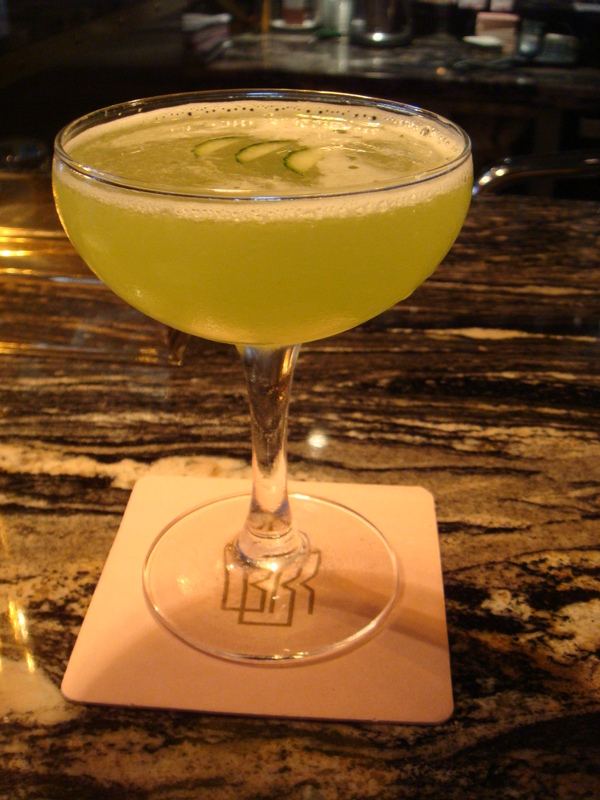 If there was ever a place I felt at home in, a place that really feels like ‘me’, it’s Bob Bob Ricard. 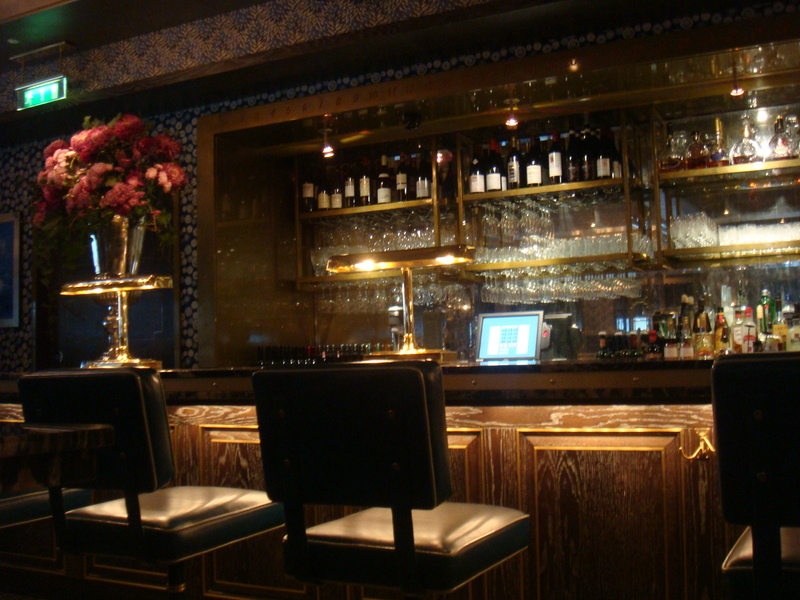 Nestled in the streets of Soho you enter into something straight from the opulence of the Orient Express. 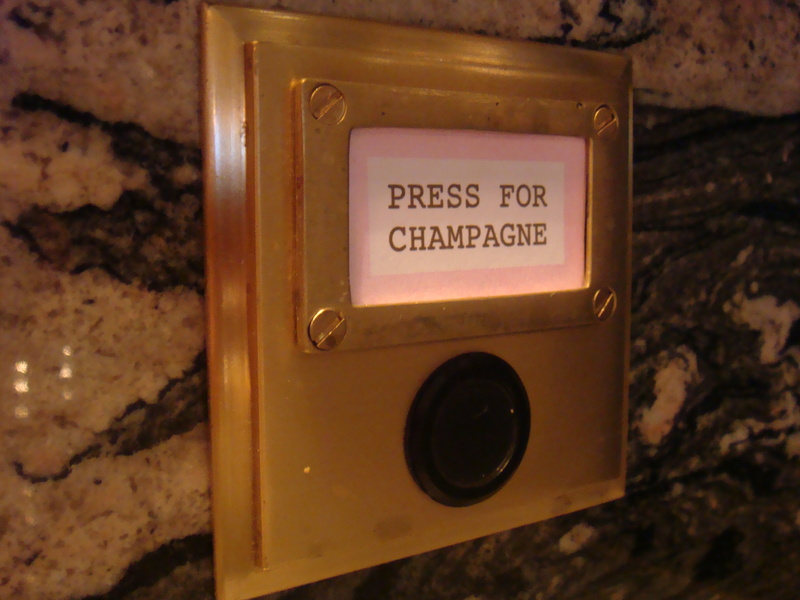 Attention to detail is what I love at Bob Bob Ricard. The ‘wallpaper’ is actually custom made, hand printed origami paper, the beautiful wood detailing, marble bar top and the tiny velvet curtains that enclose you into your own private booth, so luxurious and it doesn’t stop there…there is the much loved button for Champagne! If you love long lunches running into decedent evenings you will certainly find a home at Bob Bob Ricard. Does it sound like I love the place? Oh yes, and let that be a warning if you continue reading. If you really like good wine you might be interested to know that at BBR they have a “reserve wine price guarantee”. So while other restaurants can make 300% on a bottle, BBR charge no more than £50 on a bottle of reserve wine. Perfect if your planning on a celebration and a few bottles of vintage Champagne. It also makes reading the menu very interesting when it is noted the price of what other establishments charge for the same bottle. Clever. Delicate cocktails, each served in a different style of glass. The signature cocktail is the rhubarb gin and tonic and it is amazing. 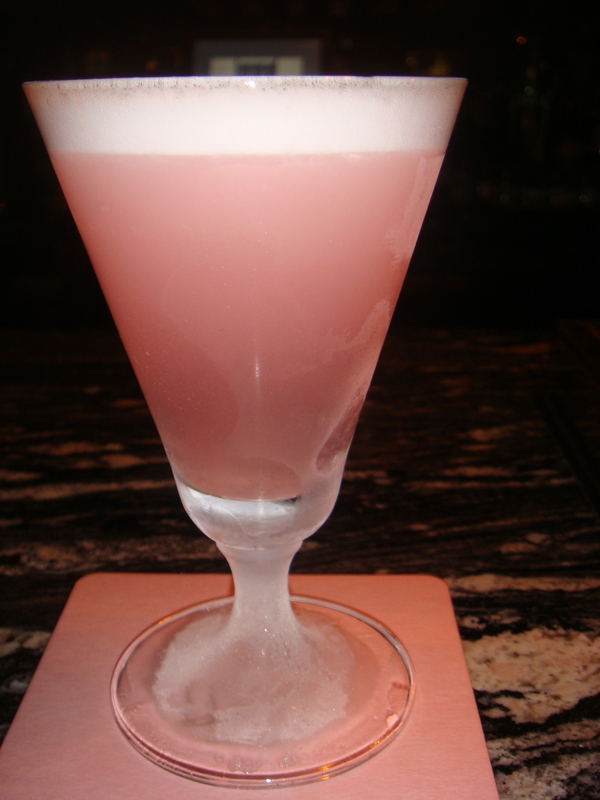 No really, even if you don’t like rhubarb you will like what they have done to it in this cocktail. My favourite snack, perfect pick-me-up and shopping stop off, is a glass of Kauffman’s 2006 vodka served with Iranian caviar, sour cream and warm blinis. 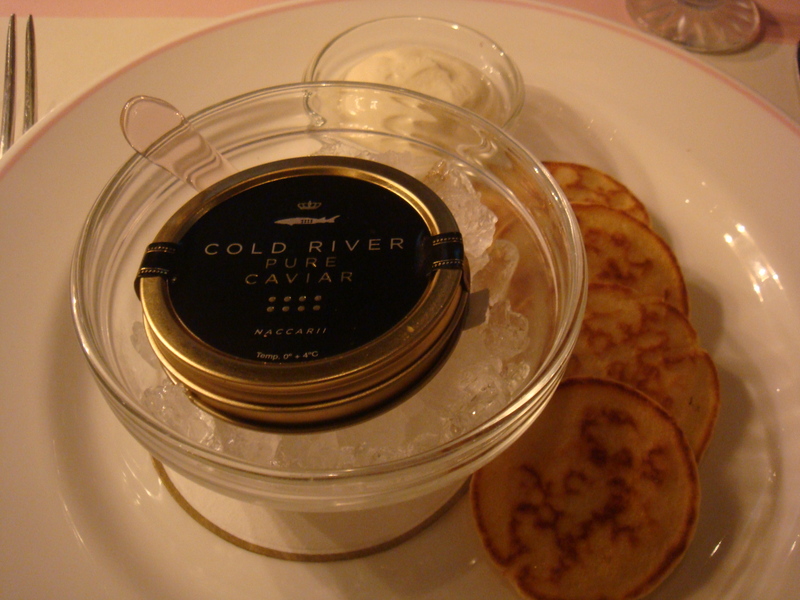 A sip of icy cold Vodka quickly followed by a mouthful of warm blini and caviar….divine. My first visit to BBR’s was for a London Food Blogger’s dinner kindly organised by Niamh of Eat Like A Girl. I have a lot to thank her for. So this was my introduction to the ‘Russian way’of Zakuski, the combination of vodka and food and the way in which it can open up the flavour of food. 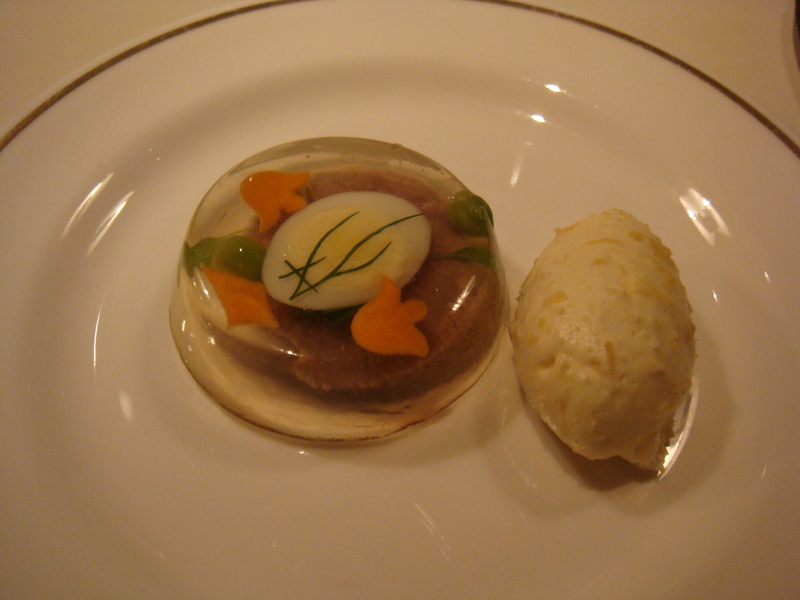 This ox tongue and quails egg in aspic and horseradish cream, was served was served with ice cold vodka (-18°C) that you drink as a shot before quickly popping an already prepared fork full of the aspic and horseradish into your mouth. The flavours seemed to love the shot of vodka as much as I did. The Anglo-Russian ownership comes through in the interesting menu, but it works. I think they blend the two cuisines very well. 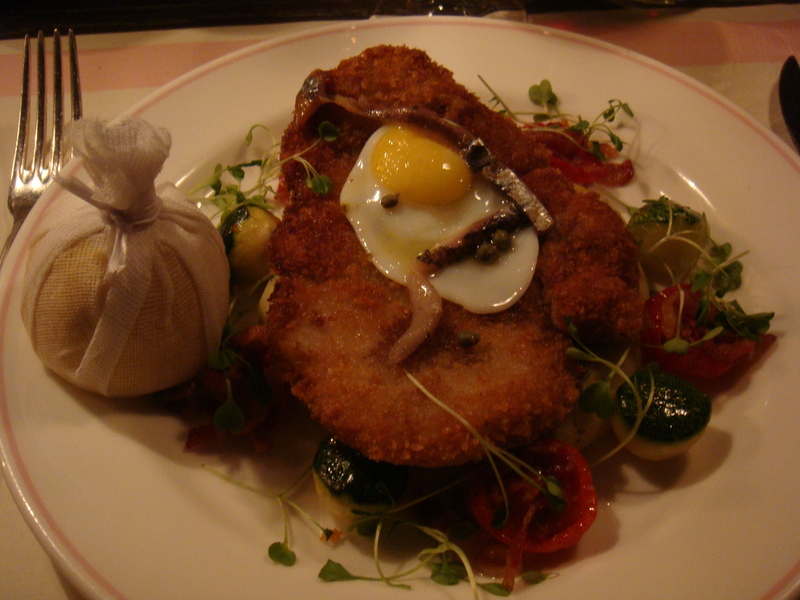 The veal Holstein with quails egg, anchovies and truffle mash is a dish apparently named after Count Holstein, foreign minister under the Prussian leader, Bismarck. It is served with a secret BBR sauce that has deep smokey undertones. 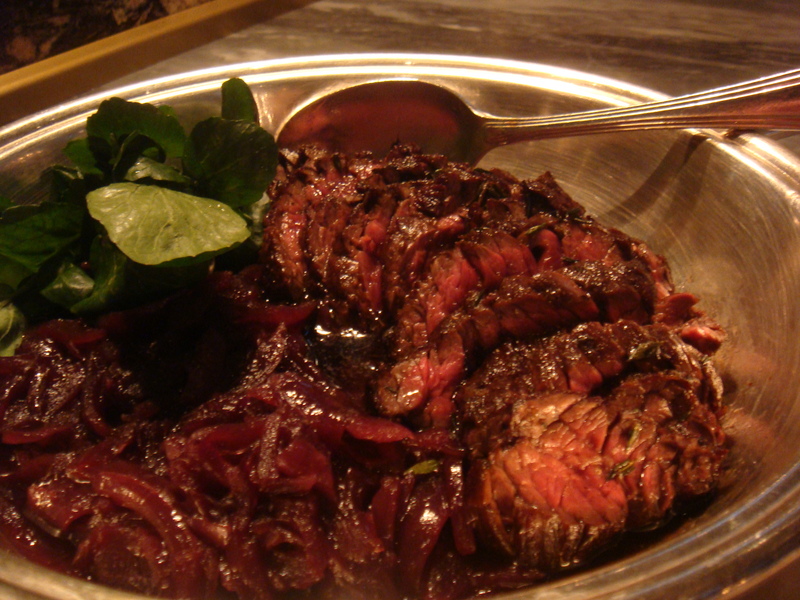 The beef onglet (using beef from O’Shea’s of Knightsbridge), served with caramelised onions. Green peppercorn sauce, buttery peas and carrots come on the side served in silverware. The beef was medium rare, tender and full of moisture and the onions sweetly sautéed. 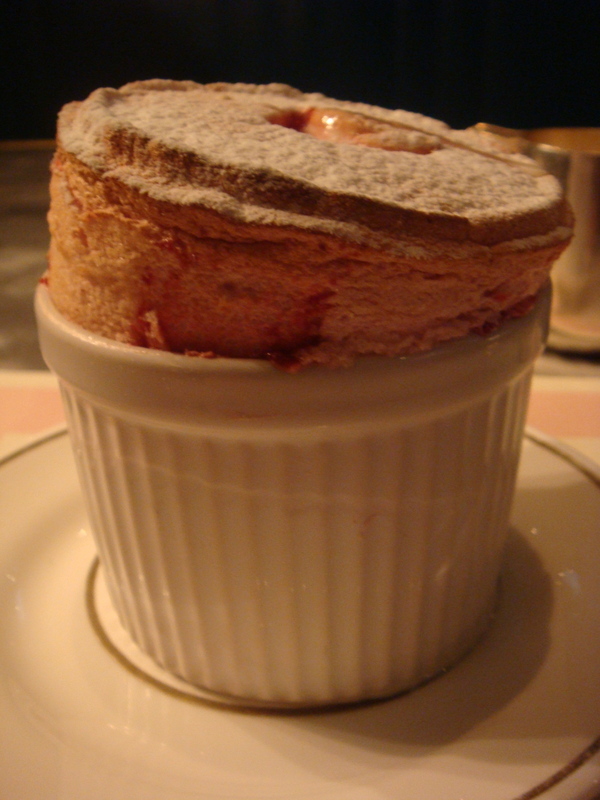 Striped strawberries and cream souffle is light and airy served with extra cream and strawberry coulis. If only my souffle’s turned out anything near as good as this one and I’d be dancing by the oven. Leonid and Richard (aka Bob and Ricard) know what people want,….to feel good. They do such a good job that I hardly notice the rising price of my bill, but BBR’s never set out to be cheap and cheerful, and I’m glad. You could never walk into Bob Bob Ricard’s without coming out feeling like you have just escaped on a little trip back to a decadent 1930’s. A place where women wore slinky backless silk dresses with big fur stoles, and gentlemen looked like Clarke Gable, and everyone was a VIP. I have been waiting to set foot in The Ledbury for years, distracted by this and that, how could I have let it pass me by for so long? Shame, shame on you Ms Macaroon. Dinner with a group of Australian bloggers could be at no other place. The chef, Brett Graham, fellow Australian, had this year received his second Michelin star, definitely time I got myself there. Ms Gourmet Chick, Greedy Diva, Catty, and I were joined by Claire Scott from D’Arenburg wines. Over numerous emails we had arranged for Brett to create a menu, just for us and specially selected wines from D’Arenburg and Katnook. Unfortunately Jo Jericho, from Katnook wines, couldn’t make it, due to her impending departure back to Australia but, she still managed to dropped off some wine for us earlier in the day. Posh jewellery on, a silky black number and my new Rupert Sanderson heels and I was off…..this was going to be good. On such an occasion a glass of Champagne was essential. Brett had been off shooting game that day so he was not in the kitchen but that didn’t stop the flow of great food coming out of the tiny kitchen. 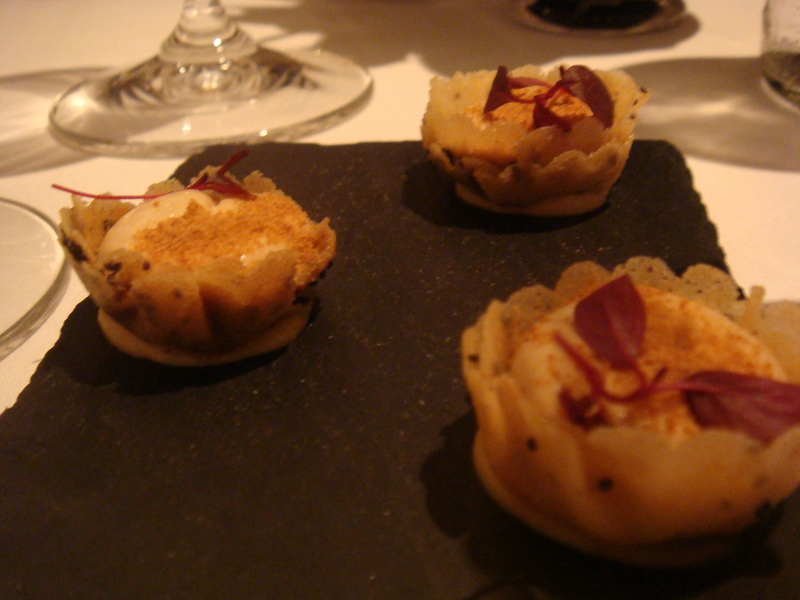 The canapè was a tartlet of foie gras with hazelnut crumbs and shiso leaves, a mouthful of soft melting buttery foie gras with textures of crispness in the delicate tartlet and ground hazelnuts. The decor of the place is a bit dated with large wood panel columns and inset flower arrangements. Although I hadn’t even noticed until half way through the meal as I was so focused on the food. Soon after our amuse bouche arrived. 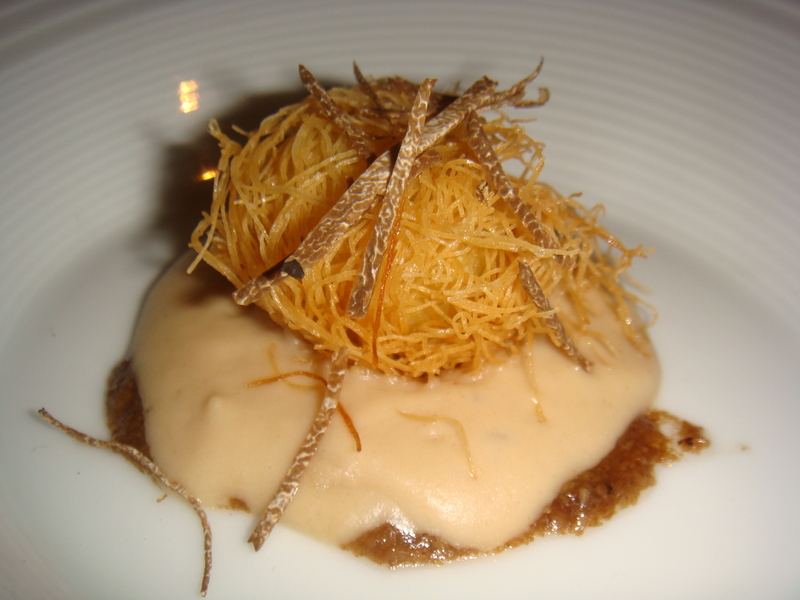 Quail egg encased in kataifi pastry chestnut puree and shaved truffles. This was definitely a starter to get your taste buds going. The textures and flavours worked so well, melting in your mouth. Hampshire Buffalo Milk Curd with Saint-Nectaire, Truffle Toast and a broth of Grilled Onions. I don’t think I could choose a favourite from our menu, but if I had to this would win the interesting dish award. 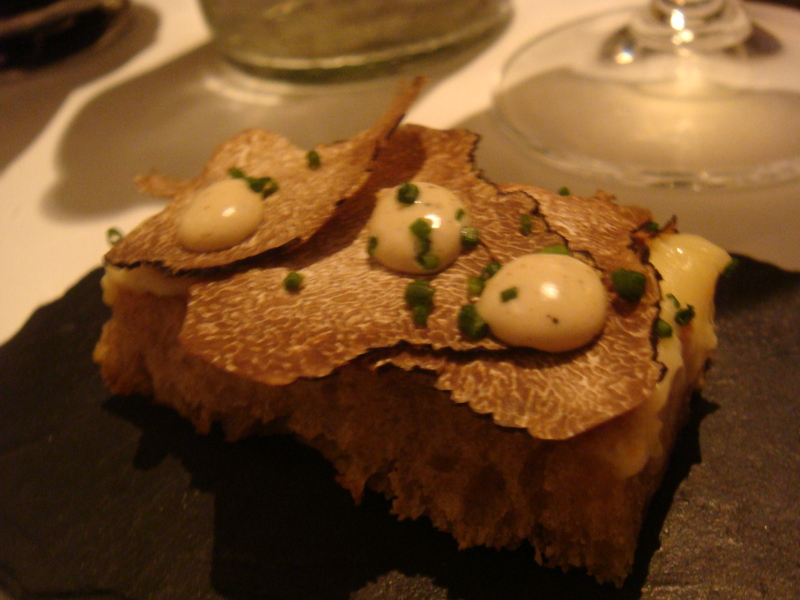 As you are mesmerized by the thick truffle toast the waiters pour the sweet grilled onion both over the dish. It’s not until you plunge your spoon into it that you discover the set buffalo milk curd at the bottom of the plate. 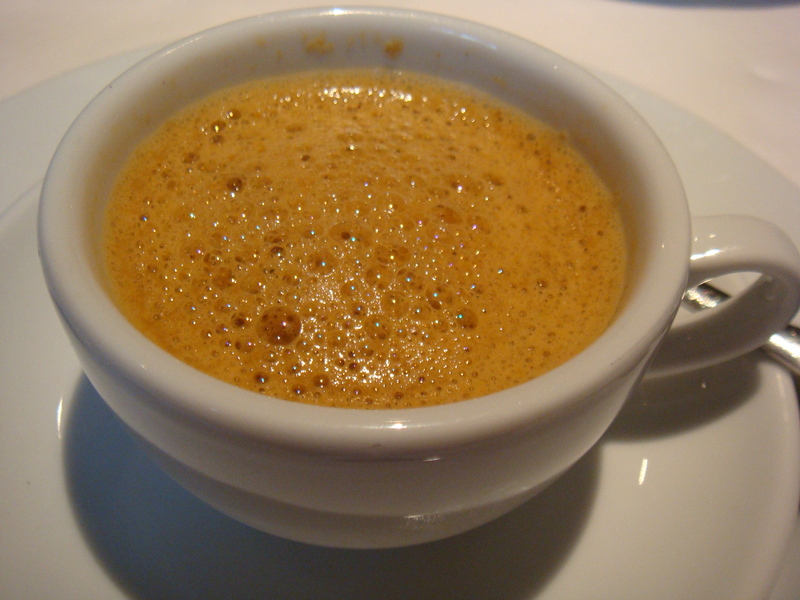 It was divinely smooth, and the truffle toast….needs no explanation. We were now getting into some more serious wines. 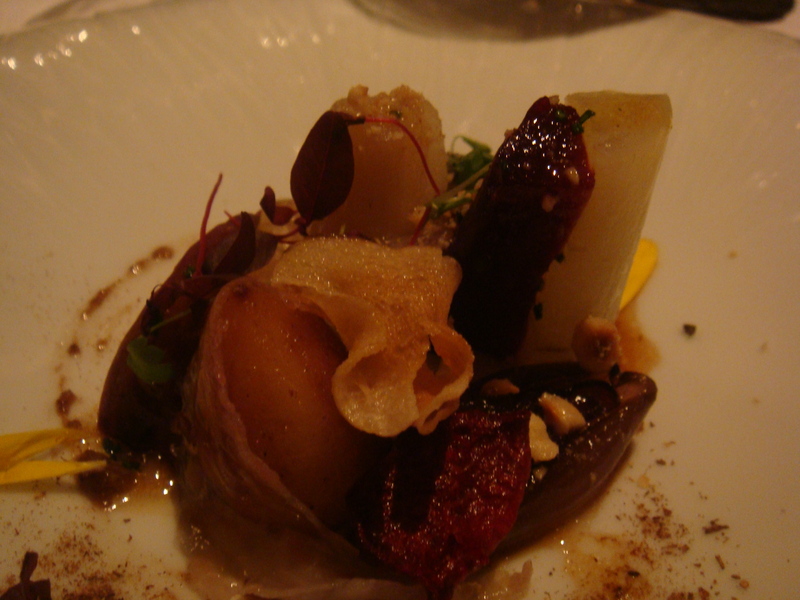 A 2005 Katnook Estate Cabernet Sauvignon, Coonawarra was paired with our next course, Root Vegatables Baked in Salt and Clay with Lardo Di Colonatta, Roasting juices and Hazelnuts. Like a city of towers, the sweet colourful roast vegetables stood beautifully together. Yes the turned jerusleum artichoke looked like a witchetty grub, coincidence or not, but cute. Roast Cod with Truffle puree, Cauliflower, Parmesan Gnocchi and Sea Vegetables. 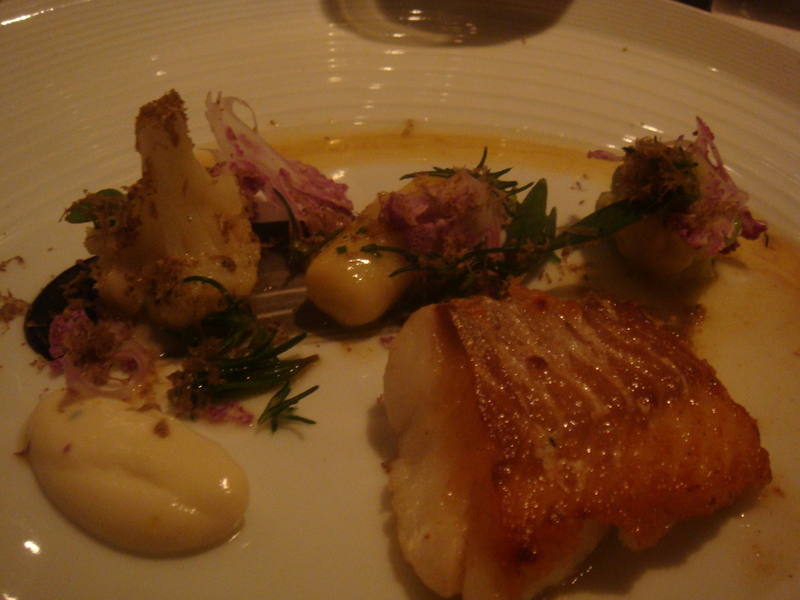 Beautifully flakey cod with a perfectly formed dense parmesan gnocchi and, again, a form of black truffles. I just love truffle season!! We still had another dish to come! I was starting to feel rather full by then. Our next course of Loin of Roe Deer Baked in Douglas Fir with Beetroot, Bone Marrow and Malt was accompanied by a reminder of how big Aussie Reds can taste, 2002 d’Arenburg “The Dead Arm” Shiraz, McLaren Vale. This wine brought back such good memories of what a good Australian Shiraz tastes like. Big, bold flavours which have been somewhat tamed over time in a bottle. The venison was so juicy and tender draped with silky mushrooms. The whole dish really worked so well together. Still sipping on my “The Dead Arm” shiraz, along came our pre-dessert. 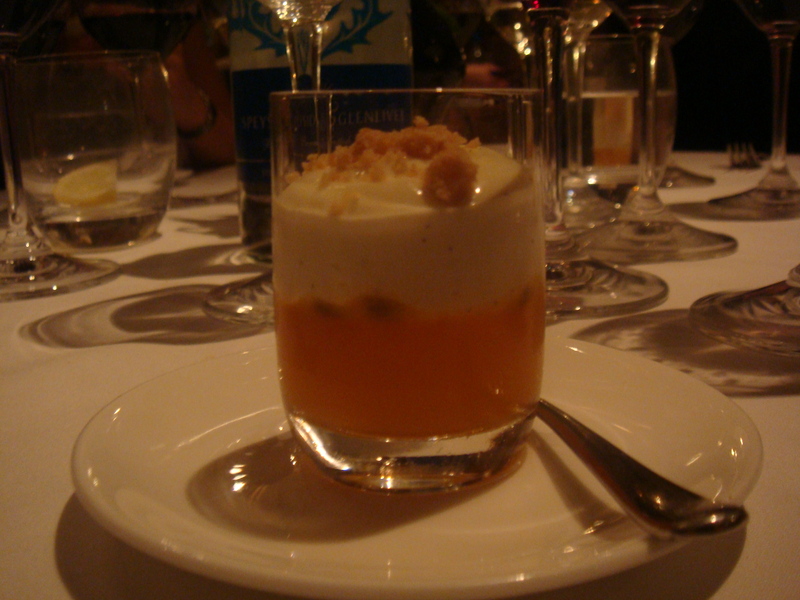 A passionfruit mousse with a creamy Sauternes froth, was actually better than my dessert. Catty will disagree but I prefer light fruity desserts. It was engulfed in no time. Dessert was Brown Sugar Tart with Muscat Grapes and Stem Ginger Ice-cream. 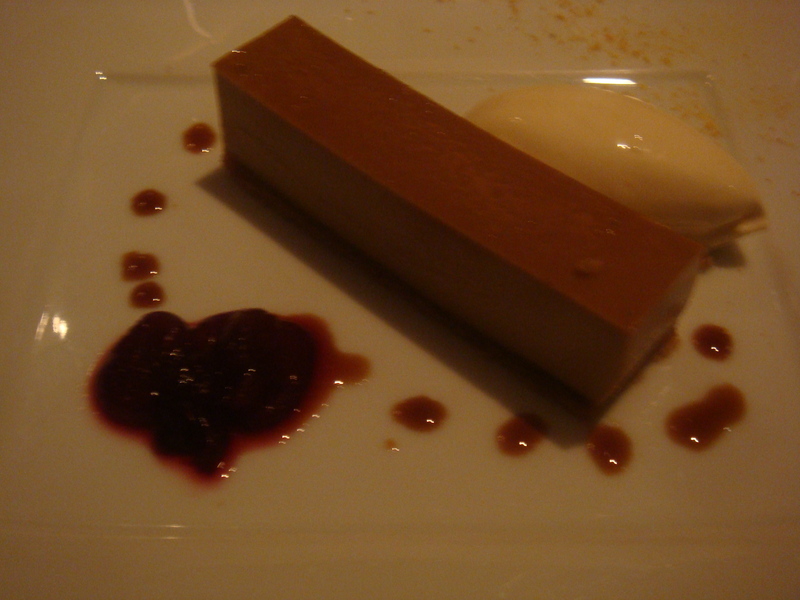 The tart was beautifully smooth with a rich caramel flavour. The stem ginger ice cream was divinely smooth. I love ginger and I thought it worked well to cut through the richness of the sweet tart along with the grapes. It didn’t end there of course. 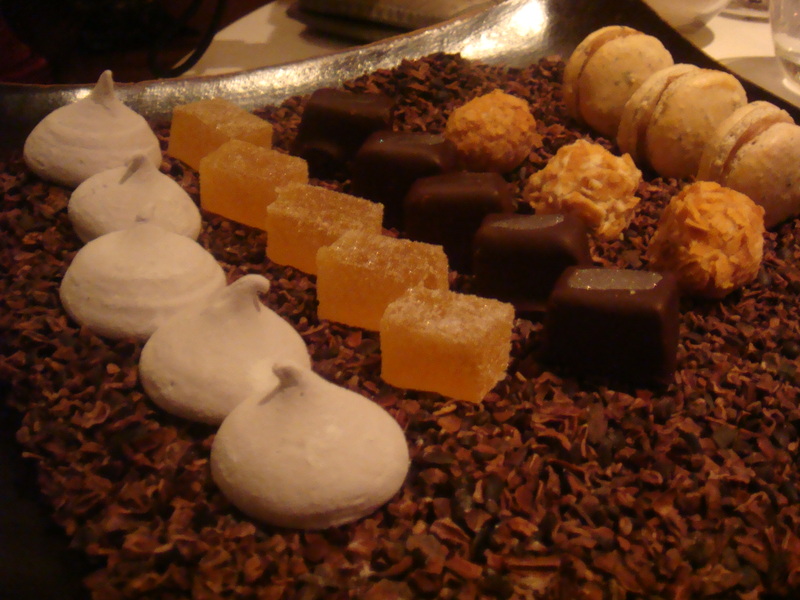 Petit Fours were presented to you to choose from on a bed of shaved chocolate. The violet meringues were soft and creamy. I couldn’t fit anymore food in by that point, so I didn’t try the other petit fours on offer, but they look gorgeous. A pot of mint tea and I was then rolled into a taxi home. 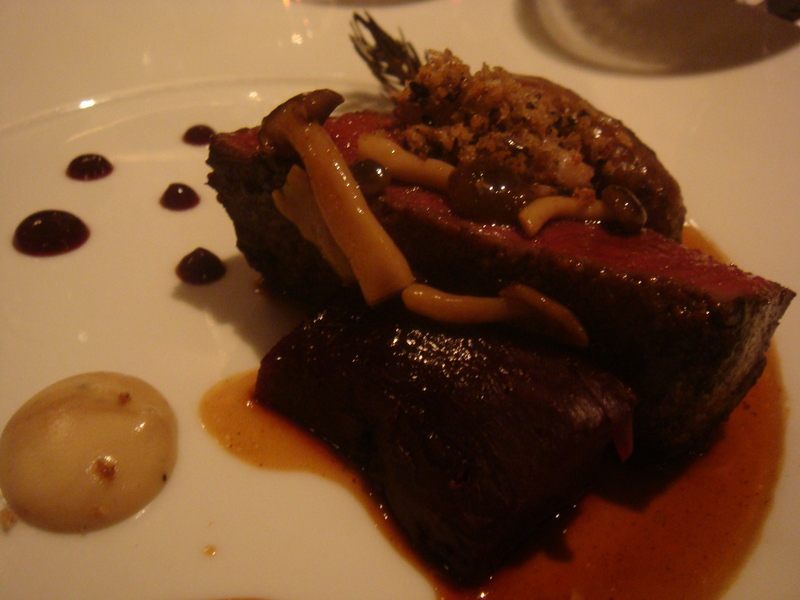 The Ledbury was indeed one of the best meals I have ever had in London. Brett Graham deserves all the praise and attention he has been receiving lately. I wish I could come back again and again and again and again. Impromptu lunches can sometimes be the best. My first visit to Racine was just that. A weekday excursion to see the Grace Kelly exhibition at the Victoria and Albert Museum definitely required a lunch to match, and Racine certainly did just that. So on my second visit I was armed and camera ready. 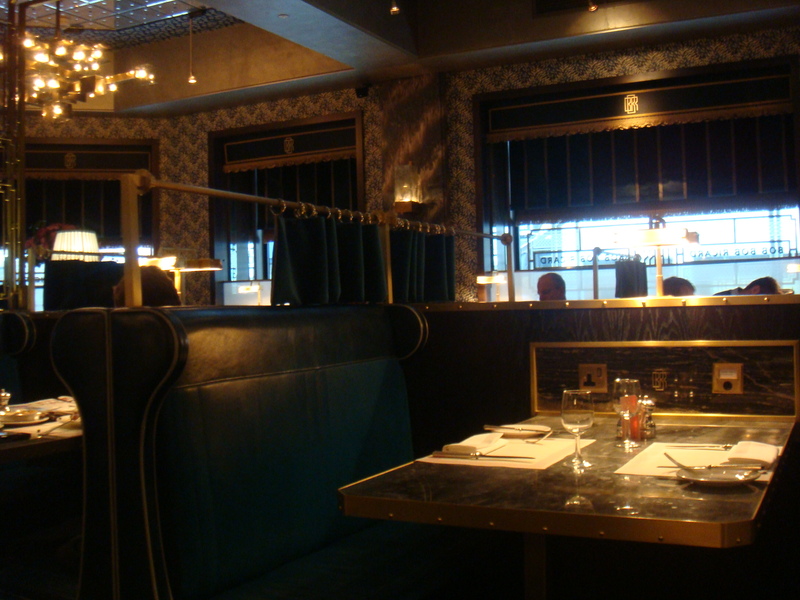 You enter through the glass doors to peak behind the curtains into a buzzy French brasserie style dining room. The sort of place you can imagine eating and drinking with friends over a long lunch. Chef, Henry Harris, has taken inspiration from the brasseries of Paris to bring solid bourgeois style French cooking to London. 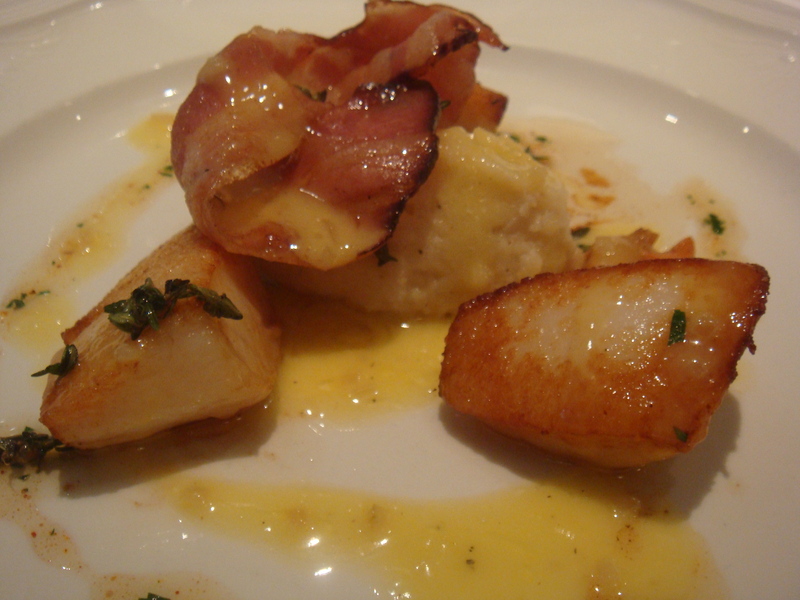 Diver caught scallops with celeriac puree and bacon, sounds good huh. When the dish was first sat in front of me I thought someone had come to blows with the scallop trying to prise it out of the shell (yes don’t laugh). Then on closer inspection I realised the scallops were huge and were actually divided (there is another piece on the other side, you can’t see in my snap). Big fat juicy scallops beautifully caramelised so that they were seared on the outside and only just cooked in the centre. The celeriac puree wasn’t completely smooth but I can forgive that because there is a curly piece of bacon on the top. This was a manly starter. 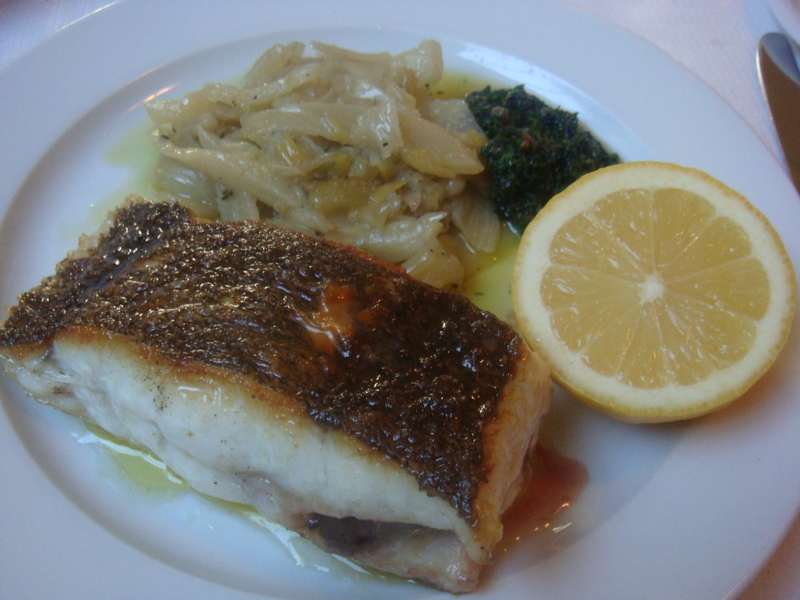 There is quite alot to choose from on the menu, à la carte, specials, or set lunch. 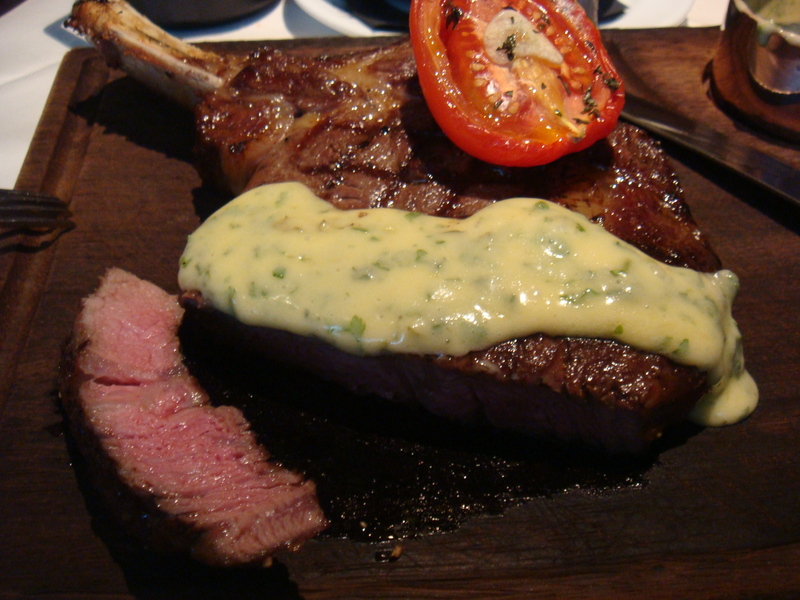 If you like good steak, Racine uses O’Shea’s of Knightsbridge, which supplies excellent 37 day hung, grass fed beef. 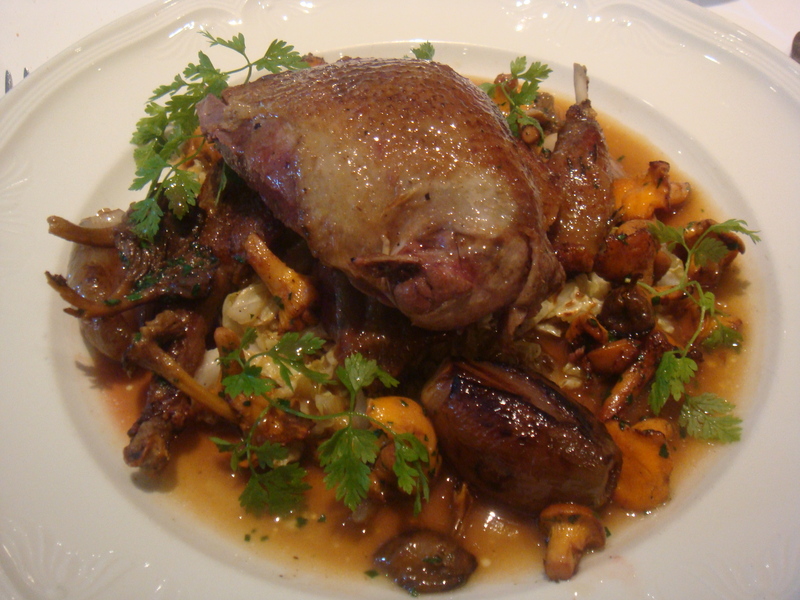 I chose the partridge from the seasonal menu. I ‘ve had it, at other establishments, where it was so rare I thought they just cut it off the bird straight onto the plate. Some may say that is perfectly acceptable, but it’s not the way I like it. Racine cooks it just the way I like it. So the breast actually reaches the pan but is still gorgeously tender and pink to the bone. 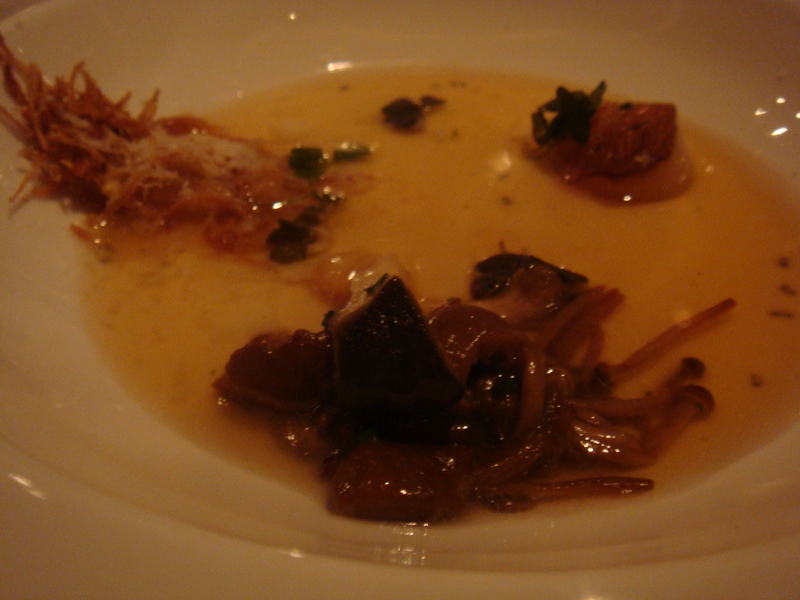 Served on a bed of cabbage with wild mushrooms, roasted shallots, delicious. The staff are ever so friendly and very helpful when choosing wine to match. I always need help, and anyway I figure they are the experts, well more than I am. They have never failed me. I remember the lemon posset I devoured on my first visit, divine. Feeling quite full at this point I went for the lemon sorbet with vodka for dessert. I excpected one possibly two small scoops so I was a bit shocked when this mountain arrived. 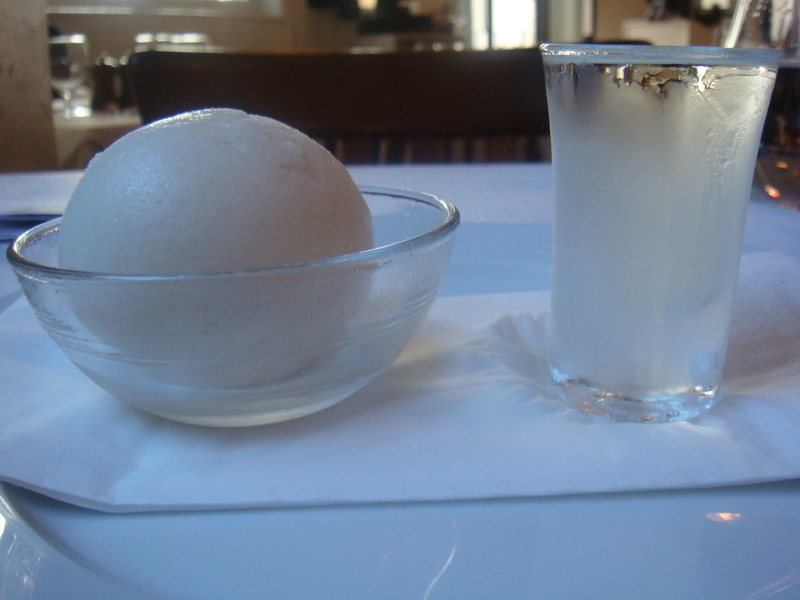 I have noticed sorbet with vodka shots seem to be a common theme of late, not that I’m complaining. Racine seems to be a place of consistency. Excellent well presented food, great lunch deals in a very pleasant dining room. I was a local in London Bridge for many years and Borough Market was like my local ‘supermarket’. I remember it before the tourist boom, when a leisurely Saturday strolling around the market was a pleasure. It wasn’t uncommon to see a few celebs (Jamie Oliver and the like) who would never be able to step foot in the place now without being mobbed. One of the more recent restaurants which border the market is the Wright Brothers Oyster and Porter House. I had walked past a few times on the weekends and looked at the place heaving. I gave up trying to get a table. Lately I have been lucky to have a few mid-week lunch times free. The focus of the restaurant is seafood. And lots of it! They source fish and shellfish from sustainable stocks and as much as they can from small day boats in Cornwall. They also have a oyster farm on the Helford River in Cornwall. The atmosphere is relaxed with wooden tables and a long bar. The menu is displayed on the blackboard in the middle of the room with specials above the chefs stoves. The choice is not easy and their portion sizes generous. This is where I usually sit, happily tucking into some oysters while watching the shucking going on. As you sit down a plate of bread appears. Now don’t think you can push this to the side in favour of more seafood. 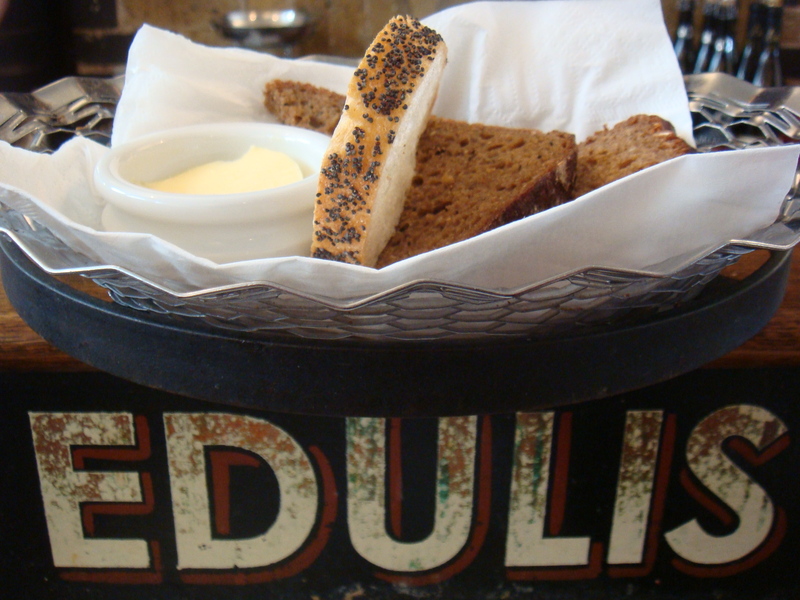 The treacle soda bread is so delicious, I always ask for more. 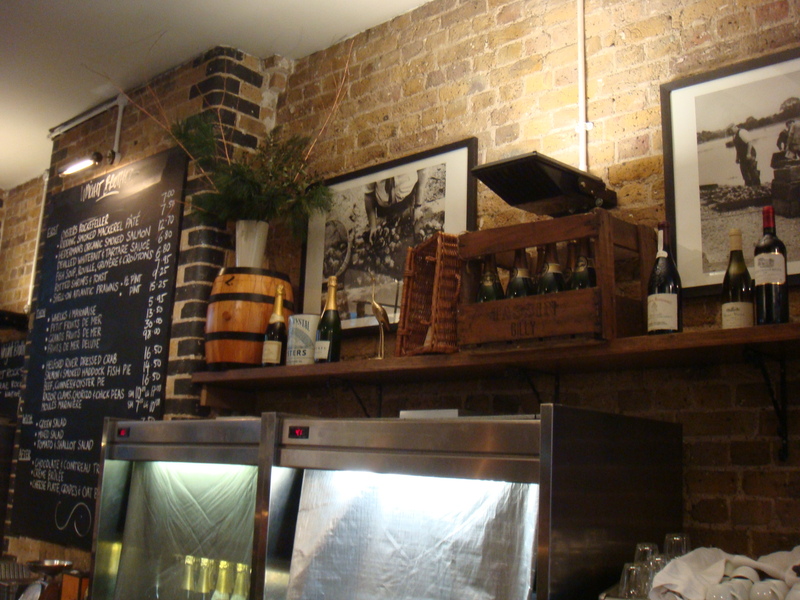 They have quite a large wine list with some great matches and interesting beers as well. Then of course the oysters. They do a lovely mixed platter, great if you want a variety and great if your still discovering which oyster is your favourite. Sorry about the missing oysters, I tucked in before I even thought about a photo. 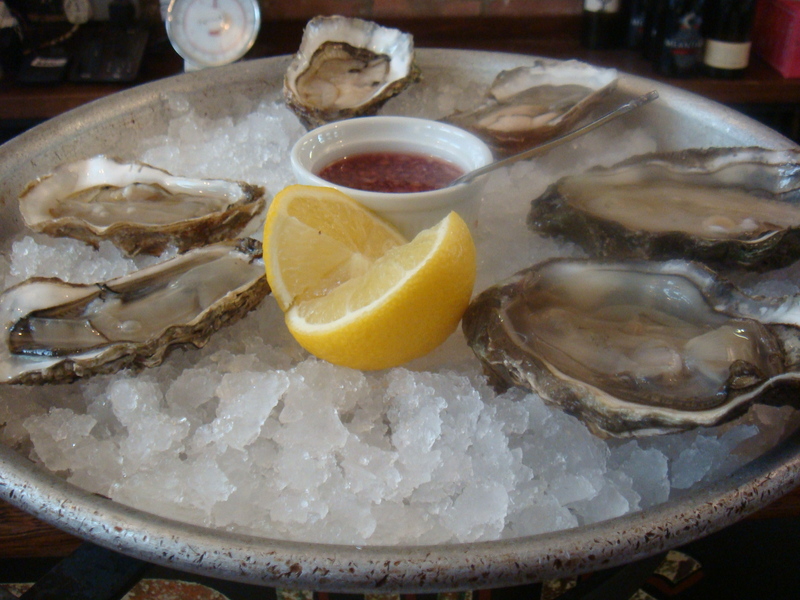 I first liked Fine de Claires then I tried the Carlingford Lough and they were my favourites, then I tried Maldon oysters and at the moment they are my favourtie. 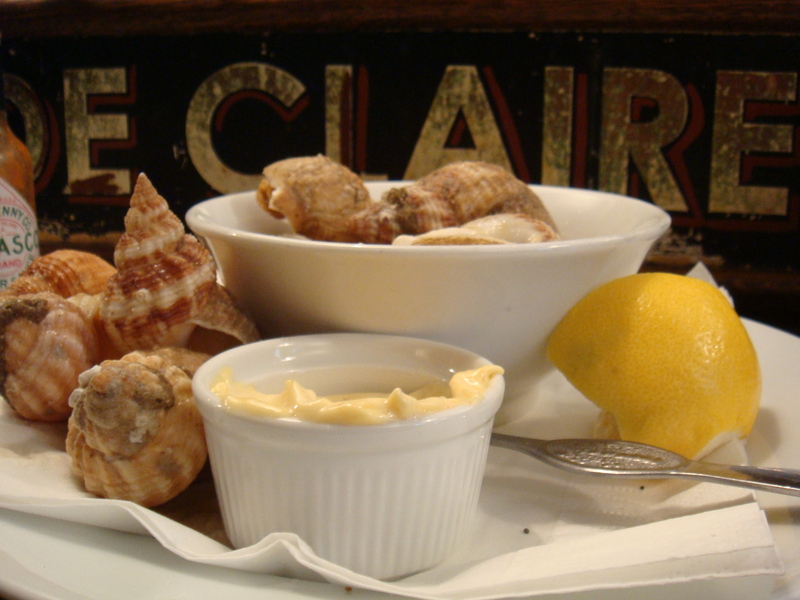 Natural, freshly shucked with a squeeze of lemon and the classic mignonette sauce, nothing beats it for me. They do them all sorts of other ways, including deep fried, if that’s your thing. Feeling brave I decided to give whelks another try, yeah no they are still not for me. Empaling their slimy body and coaxing them out of their shell, with a sort of rubber-like texture, even with the rich mayonnaise, I couldn’t do it. 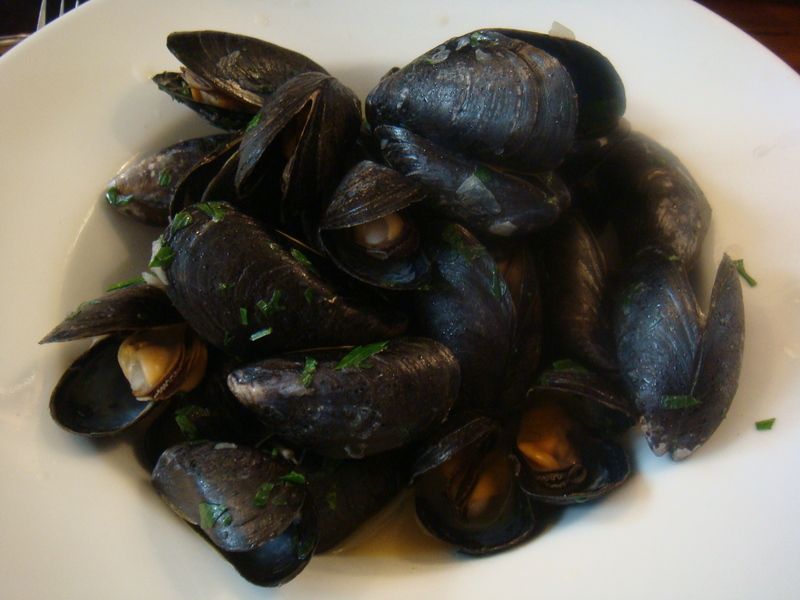 Their moules marinière are soft and meaty too. This place is all about the food, no airs or graces required just get into it it fingers and all. 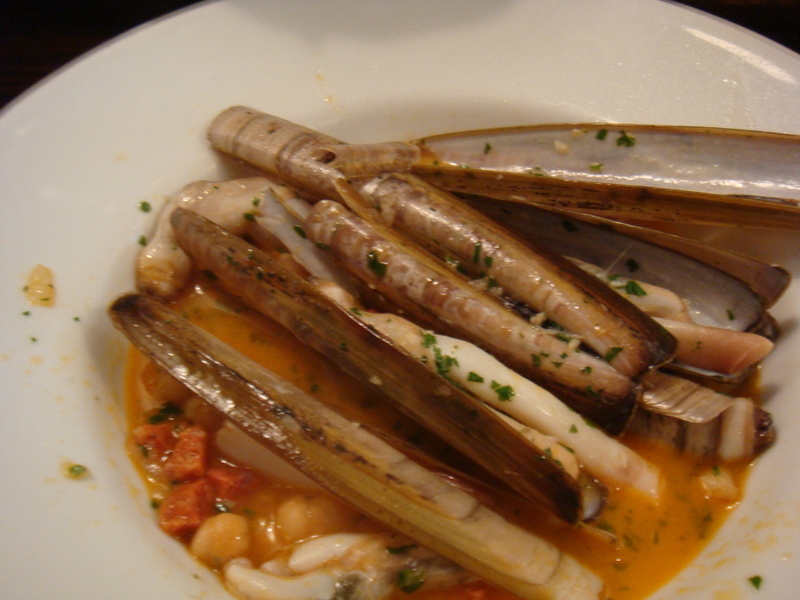 If you like razor clams, Wright Bros do a delicious rustic razor clams with chorizo and chickpeas. 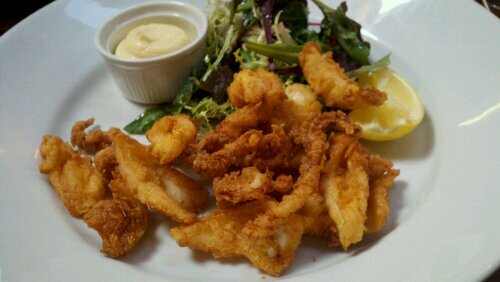 I cannot resist a plate of tender fried squid. Crispy perfectly cooked little tender bites. I love the relaxed style of cooking whilst still respecting the food of the sea, not complicating the flavours but relying on good produce to be the focus of the plate. The dishes are reasonably priced, the staff friendly with a buzzy atmosphere. This place is always busy and rightly so. They are opening a new restaurant in Soho early November. I’m sure it will be just as popular. “You need someone to come to lunch with you?”, “Malmaison??? OK why not”. Little did I know what was in store for me… Malmaison is in Charterhouse Square, a lovely square tucked behind Barbican tube station. Home to the London Medical Deanery and one time Monastery, hospital and school. Thank goodness I was quite hungry when I arrived because once the food started coming, it didn’t seem to stop. 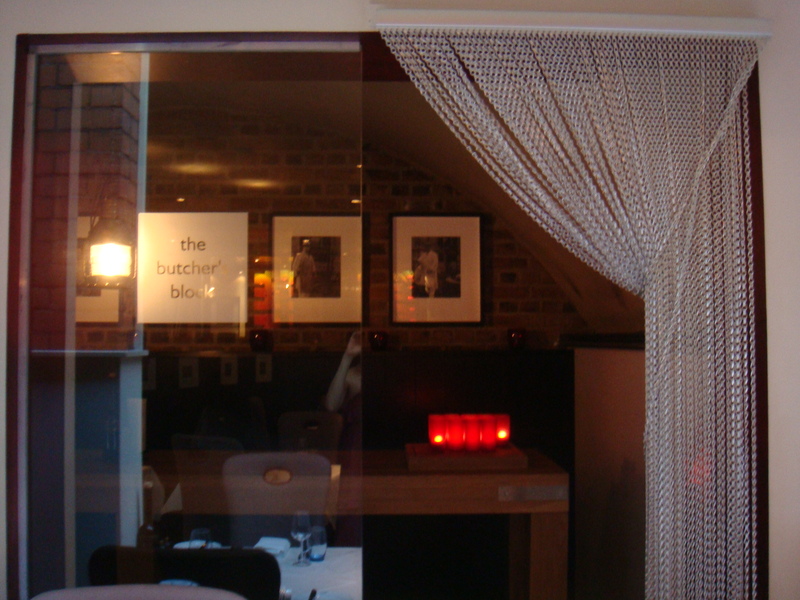 The Winesleuth and I were booked into ‘The Butcher’s Block’, a private room dedicated to the butchers of Smithfields. They carve up ribs and steaks at the table to share, sounds like fun. It was a bit dark for my little happy snapper, so we opted for a table in the main dining area. The entreé was a twist on a classic combination of crab and avocado. The avocado was very lightly crumbed but remained fresh and just ripened inside. The Dorset crab was well dressed with out drowning it. The chilli and citrus salsa left was dressed around the plate so you can have it with a bit of a kick, or not. I loved it, it was gone in a flash. Luckily my lunch companion was there to check out the wines. She is pretty clued up and being familiar with Bibendum wines, had spotted that they supply Malmaison, before we had even sat down. 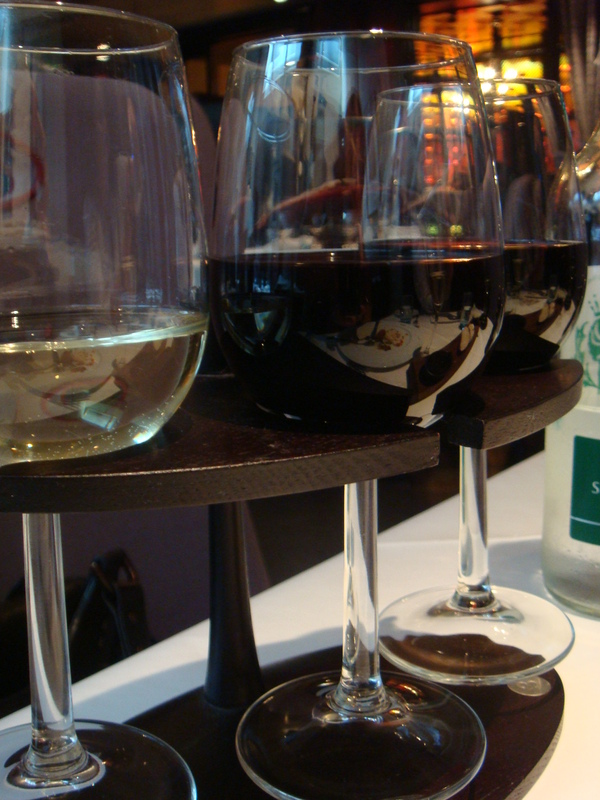 Our wine flight was chosen by Stuart, the new Sommelier at Malmaison London. He did very well too, choosing a Chapel Down Bacchus for my crab entree and a Côtes du Rhône and Australian Shiraz, for my main choice. I’m not going to pretend I know much about wines. If you want to know what The Winesleuth thought you can visit her post here. The chef, John Woodward, had made a crab bisque and wanted to give us a little try. Made with crab shells, brandy and pastis, this little soup was packed with flavour. I couldn’t of had a whole bowl, but a little cup was the perfect amuse bouche. The special for the day was côte du boeuf with béarnaise sauce, feeling like I had the appetite of an Alaskan lumberjack I couldn’t pass it up, neither could the Winesleuth. Wooh! I didn’t expect it to be that big! Perfectly cooked medium but still pink, it was soft, tender and moist Donald Russell steak. I’ve never had meat from Donald Russell before and it was mighty good. The béarnaise was a little thicker than I would have liked, but now I’m just getting picky. 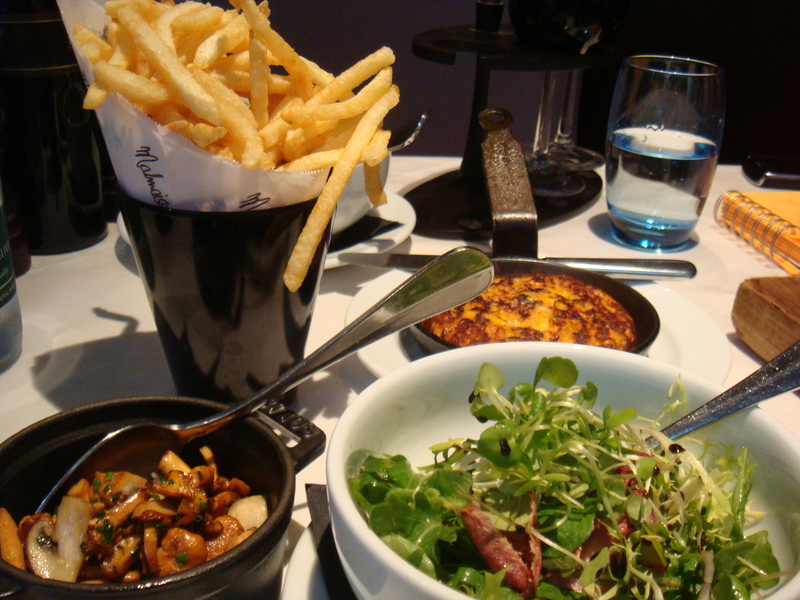 The sides were great as well, great fries, mushrooms, salad leaves and the most delicious sweetcorn and chilli pancake. I had barely made a dint in the steak and I was full. I guess the lumberjack feeling was a bit exaggerated. Cheeky as I am, I asked for it to be wrapped up to take home. They didn’t seem to mind, I hope they didn’t, but they would have only thrown it out and I got 2 lunches out of it! It was just as tasty then too. After all that the Winesleuth wanted to try the ports and when the cheese trolley was unveiled to us there was no point trying to fight it. 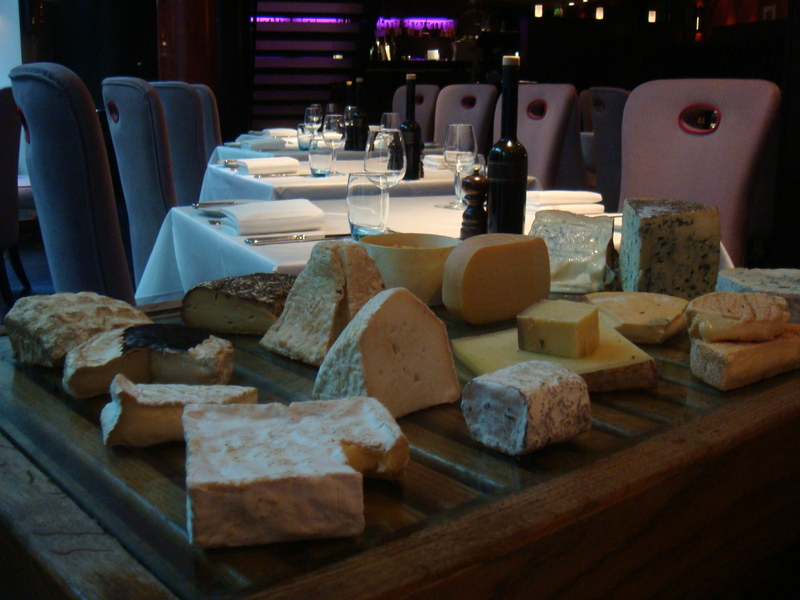 A good selection of English and French cheeses from La Cave were equally matched by the port. Dessert was a smooth crème brûlée. 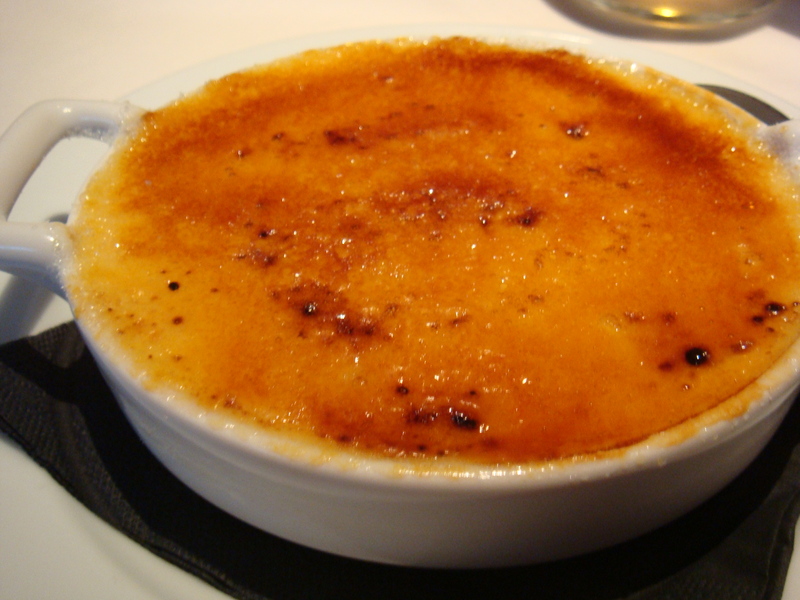 A crisp caramelised top with a creamy vanilla brûlée. I have to say I was starting to feel like a small whale at this point. 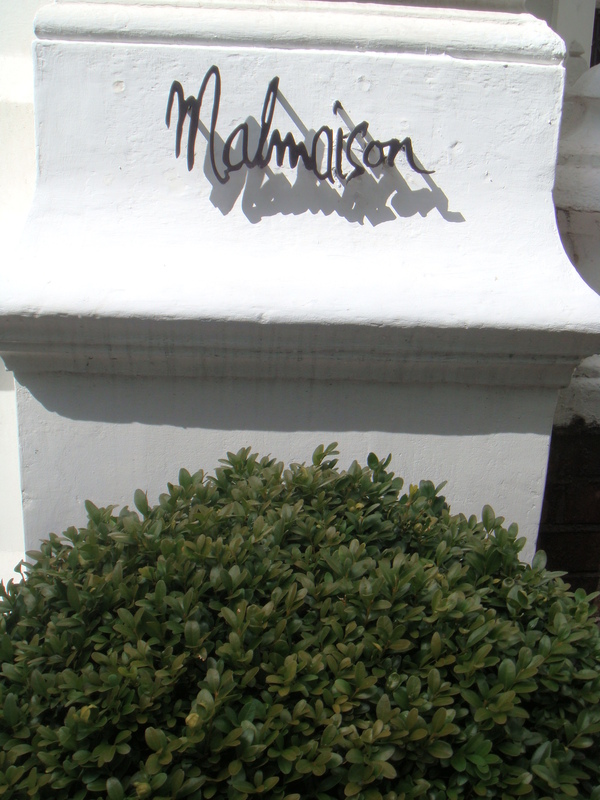 Malmaison are a small group of lovely hotels across the UK. They don’t come to mind as a place I would choose for lunch. I never expected the food to be quite so good and I never expected them to have great suppliers such as Donald Russell, La Cave and Bibendum. They have a few private rooms off the main restaurant which would be great for small Christmas parties, lunch meetings or small events. The interior was a bit dark for my liking, with alot of black and grey but the food made up for that and I soon forgot about it. I love to have a peak at the rooms whenever I eat at hotels. 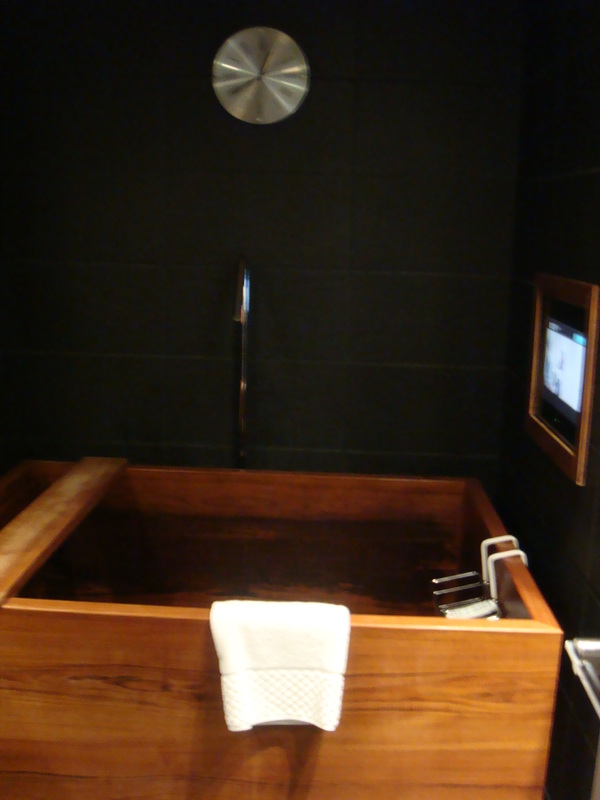 Maybe it’s the urge to use the bed and have a nap after eating that spurs me on, although this time I wanted to soak in that tub! Ms Macaroon dined as guests of Malmaison London.